Welsh Athletics hosted the 2015 UK 100km Championship and Anglo Celtic Plate – and Scotland’s Ross Houston delivered a superb debut in international ultra running. It was a good day, too, for the Scotland women’s team of Rosie Bell, Charlotte Black and Keziah Higgins as they took the team golds. The event was last held on the same two-mile course three years ago in scorching conditions. 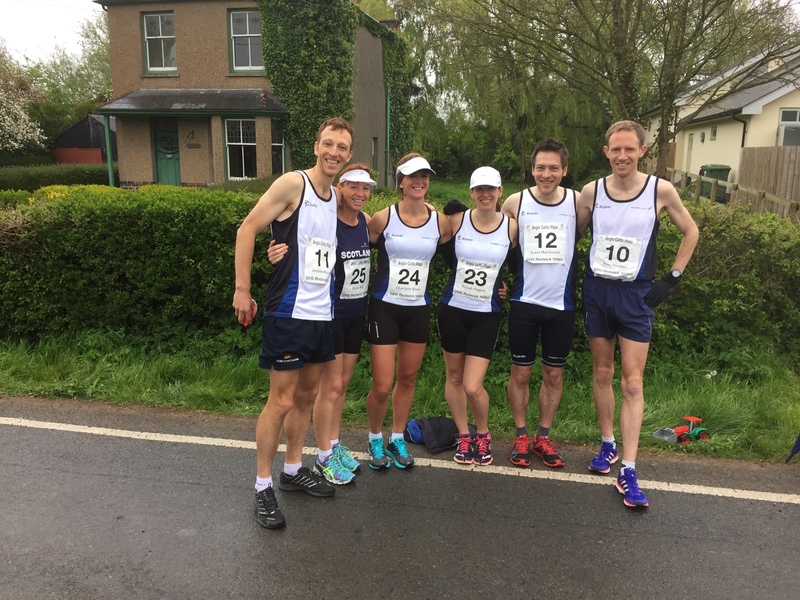 This year it was perfect for distance running with cool temperatures and some light rain as 18 runners took to the start line in what proved to be a day of personal bests. The event was a journey into the unknown for Scotland’s Houston (Central AC). 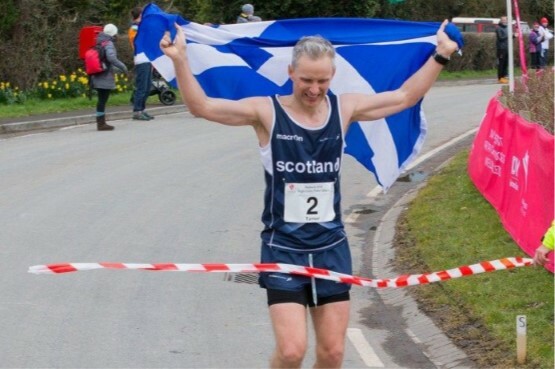 The Glasgow 2014 Commonwealth Games marathon representative, with a PB of 2:18:28, was stepping up to 100km for the first time. 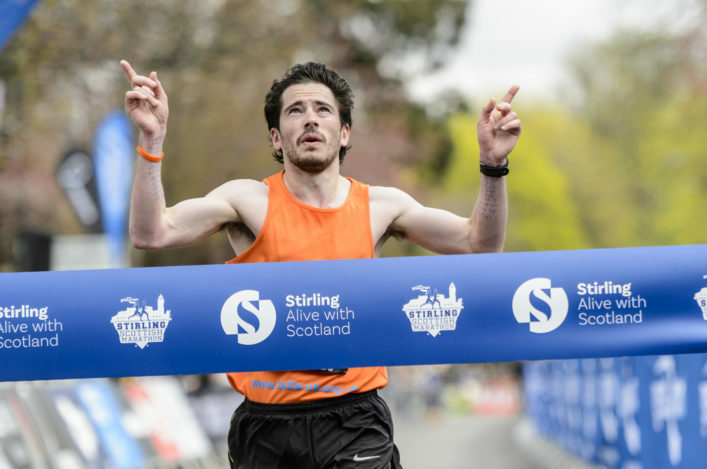 He along with fellow Scottish men Andrew Murray and Grant MacDonald were up against a strong English contingent including 2:16:40 marathon man Phil Anthony, also making his 100km race debut, GB 100k international Craig Holgate and experienced trail and road ultra runner Marcus Scotney. After a brisk start, Ross settled into a consistent pace covering each lap with incredible consistency in 12.20. 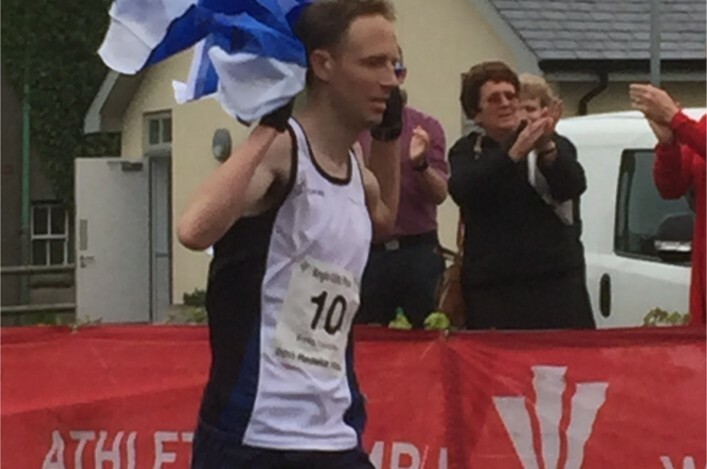 It was England’s Phil Anthony who took the race on after the first few laps and increased his pace to sub six-minute miles, opening a lead over Ross. Through 60km Anthony, continued to lead Houston by 3 minutes, with Holgate and Scotney now over a lap behind. Between 60km and 70km the race changed dramatically, with Houston sticking to his consistent pacing he overhauled Anthony and by 75km had built a lead of 1.50. He was heading for a stunning 6 hour 40 debut. Anthony was visibly suffering and dropped out of the race just before 80km with a hip problem. A decision not taken lightly, but with long-term wellbeing in mind. In the last 20km and in unknown territory Houston started to slow, but he dug very deep. This was a gutsy performance from a 100km novice and holding it together in the final laps he crossed the line in an amazing 6hr 43min 35secs to become UK and Scottish Champion. Little did the Central AC athlete he had also become the 6th fastest GB and 3rd fastest Scottish male on the all time Road lists. The two athletes ahead of him are Simon Pride with 6:24:05 and Don Ritchie 6:28:11. Ritchie does, of course have a superior track mark of 6:10:20, which remains the absolute world best performance for 100km. It was a brilliant debut and augurs well should he feel that ultras are to his liking. Meanwhile, the battle behind ended with Holgate (ELY/England) in second place in 7.10.30 and Scotney (England) third. 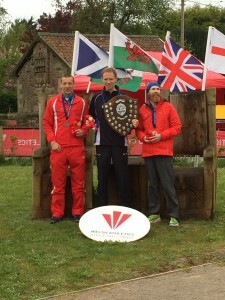 When Jon Sharkey (Bournemouth/Engand) crossed the line it secured the Anglo Celtic Plate team competition for England. Scotland with Murray in 6th (7.41.25) and MacDonald 11th (8.17.33) were solid finishers to ensure second team and the silver medals. Houston also achieved the individual qualifying mark set by British Athletics forthe World 100km championships in Holland in September. Achieving that along with winning the championships, will get automatic selection should he decide he wants to run another one ! He said: ‘All the advice I received beforehand was that you had to be patient in the early stages of a 100k, in order to be strong in the last third. ‘I set off aiming to hold 6.30 miles, which I knew would feel very easy, and although I was leading after the first lap, when Phil came passed me shortly afterwards, I just let him go and stuck to my plan. He was certainly struggling when I passed him around 75km. ‘The last 15 miles, I was struggling to hold down drinks, and it was certainly as much of a mental challenge running those last few laps, as a physical one. ‘The feeding support, feedback during the race, and encouragement I received from Craig (Craig Stewart, former Sal 100k champion) and Val (Val MacAulay, team manager) was tremendous and really helped, especially in those final laps. Houston had prepared well, setting a course record in the 33 mile Dee 33 trail race in March, and putting 40mile training runs into his schedule. It certainly paid off, and showed, as with Steve Way and Paul Martelletti last year, it is certainly possible for competent marathon runners to take on the challenge of 100k or other shorter ultra’s without too much change in training. In the women’ss race, Katie Samuelson, (England) led almost start to finish to win the individual race in 8.38.11. Late withdrawals had disappointingly prevented Wales and England fielding full teams. This left the Scottish trio of Rosie Bell, Charlotte Black and Keziah Higgins to dominate team proceedings. 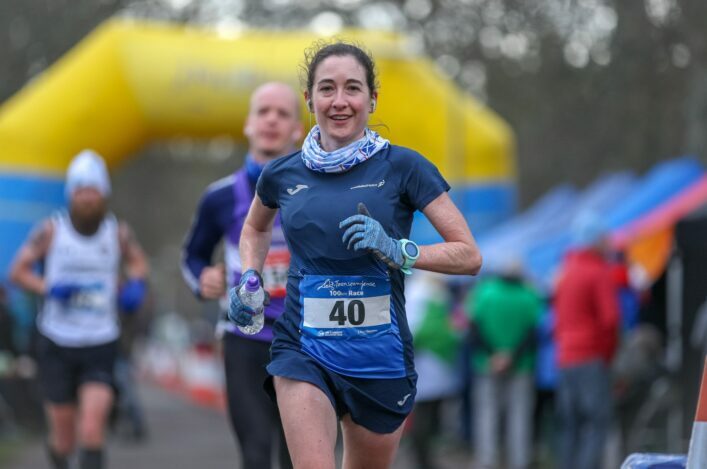 The hugely experienced Bell, three times winner of the 95 mile West Highland Way trail race at one point took the lead from Samuelson but by the finish the English woman had built a five minute lead over Bell, who herself was over 7 minutes ahead of the third place runner, Natasha Doyle of Wales. Bell held it together to finish in second place overall and take the Scottish ladies title in 8.48.58, a new PB by over 10 minutes. 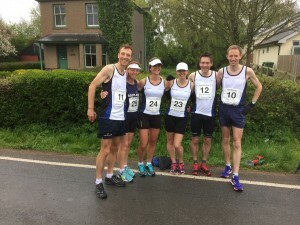 Both Black and Higgins encountered difficult times during the race yet reached into their mental and physical reserves to finish in 9.33.18 and 9.48.44 respectively, helping Team Scotland to the ladies Anglo Celtic Plate title. Report and Pics from Craig Stewart, who was part of the Scottish support crew.